After bewildering residents and officials of Sweden by suggesting Saturday that a terror-related incident had occurred over the weekend in the small Nordic nation, President Donald Trump attributed his comment to a Fox News interview with a conservative filmmaker. 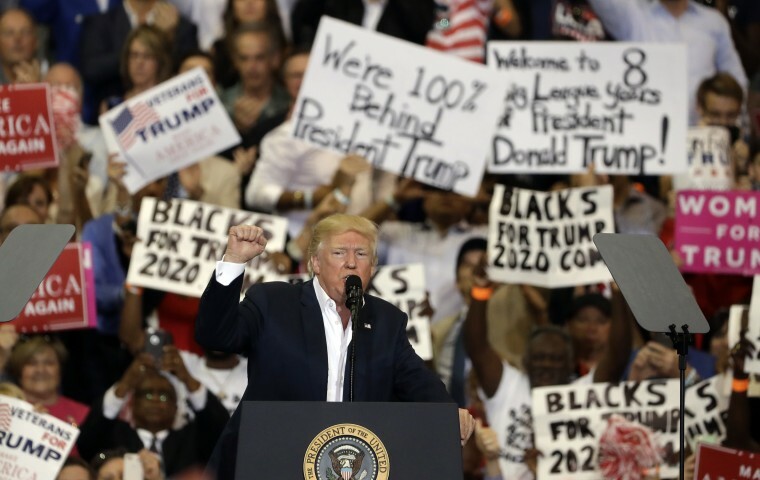 It was unclear following the rally what could have occurred in Sweden to draw the president's attention, and the Swedish Embassy asked for clarity. Trump took to his Twitter account Sunday evening to explain that he was referring to a Tucker Carlson segment that appeared on Fox News Friday. In the segment, Carlson interviewed right-wing filmmaker Ami Horowitz, who had recently made a documentary about Sweden's refugee policy. The segment did not contain breaking news. A spokesperson for the Swedish Embassy said they didn't know if Trump's tweet served as the government's official response to their request for an explanation. "We have asked State Department if President Trump's tweet is their official answer to our question earlier today. We are still awaiting an answer on that," the spokesperson said. A White House spokesperson had attempted to explain what Trump had been referring to prior to Trump's tweet. "He was talking about rising crime and recent incidents in general — not referring to a specific incident," White House Deputy Press Secretary Sarah Huckabee Sanders told reporters. But the country had spent the day baffled, because the president had said "last night" and nothing appeared to have happened. “Sweden? Terror attack? What has he been smoking? Questions abound,” Carl Bildt, a former Swedish prime minister, wrote on Twitter while he attended the Munich Security Conference on Sunday. Sweden's Foreign Ministry spokeswoman, Catarina Axelsson, told the Associated Press that the Swedish government did not know of any "terror-linked major incidents." Additionally, the Associated Press reported, Sweden's Security Police had not seen any threats or responded to any attacks. Sweden's U.S. embassy also appeared to take a jab at the president on Twitter Sunday evening, retweeting Trump's earlier justification and saying: "We look forward to informing the US administration about Swedish immigration and integration policies." Trump's remarks were not the first time that somebody in his administration has referred to nonexistent terror attacks as they defended his executive order restricting travel for people from seven predominantly Muslim nations. White House Counselor Kellyanne Conway invoked a “Bowling Green massacre,” which never occurred. Conway has since said she made a mistake. White House Press Secretary Sean Spicer cited a nonexistent terror attack in Atlanta, then later claimed he meant the shooting at the Pulse Nightclub in Orlando, Florida — a city more than 400 miles south of Atlanta. A Somali refugee, radicalized in the United States, is the only person from one of the seven countries Trump's first executive order barred to have committed a terror attack in the U.S.
Sweden, meanwhile, has not experienced a terrorist act committed by a refugee or person of the Muslim faith since December 2010, when an Iraqi-Swedish national detonated a suicide bomb. Two people were injured and only the attacker was killed in the explosion. According to the State Department's Bureau of Diplomatic Security's Crime and Safety Report on Sweden, released last May, overall crime rose 4 percent in 2015. The increase was attributed to the rise in computer fraud. A section of the report is dedicated to terrorism threats, and provides the nation a "Terrorism Rating" of "Medium." In 2015, the country received between 160,000-190,000 asylum seekers, which is the most per capita in the European Union. On Sunday, in response to Trump, a popular Swedish tabloid described the biggest, most violent news stories that it could find from Friday: A man set himself on fire in Stockholm, an 83-year-old singer suffered technical difficulties during rehearsal for a big music competition, a man died in the hospital after a work-related accident, an avalanche warning was issued in northern parts of the country and Stockholm police engaged in a high-speed pursuit of a drunk driver. The tabloid also noted another incident: A photo of a moose bull attempting to get frisky with a wooden moose lawn ornament had gone viral.